Very nice crystal clear light medium green. Hard to imagine as totally natural due to it's one dimensionality. Attractive, nonetheless. Very good trails at first. Quite entertaining. This continued until louche reached 2:1, at which point it was fully clouded. Final color was a pastel/seafoam green with yellow highlights and glints of blue around the meniscus. Really quite pretty. Pleasing... wormwood and anise predominate. There is immediately, to me, a slight vegetal note I have difficulty defining (not fresh, but almost earthy like a root vegetable). It is not off-putting, in fact it kind of begs me to go to palate. However, if it were any more forward, I would consider it to be a clear fault. I find it to be an additional complexity that adds character, but I think this will boil down to a real personal taste issue. Because of this peculiarity, I must give this category a 3. Not simple, but not highly complicated, either. Nice balance between the wormwood and anise mid-palate, a spiceiness on the back-palate/finish. Along with the spice, some noticeable heat. Nice wormwood "pinch" on the palate that builds with each sip, and begs me to take another. Again, that vegetal thing, while interesting, keeps this one from getting a 4 here. Quite a nice, long finish that follows the palate very accurately. This is always a critical factor for me with any beverage, since I really do not like schizophrenic palate/finish combinations. The bit of heat persists in the finish and palate numbing is noticeable, but the vegetal character disappears. Overall enjoyable, and makes me want to dive back in. Very pleasant. Not a challenging absinthe, so great for someone new to absinthe, like me! I would keep this one around. 7/04/09 Revisit - Most of my initial observations remain consistent. The most notable difference is that the "vegetal" aroma and flavor referred to in the initial review, while still present, seem better integrated to me now. I am also observing a slight prickliness on the palate, probably due to coriander. Or I wonder if, perhaps, there is a slight amount of star anise in this formula? Overall still very enjoyable, and I've also found it to be quite competent for cocktail use. Done with a 1 ounce dose, diluted 3:1, 3.5:1, 4:1 and no sugar. It's color is most definitely green, but to me it seems unnaturally so. Very bright. Ice cold water creates amazing oil trails from the beginning. It gets progressively cloudy, but doesn't really build from the bottom so much as clouds up everywhere. If I had seen good layering, it would have easily received a 5. After water, it turns into a nice opaque white/green. The brightness of the green color calms down and becomes much less artificial looking. Inviting. The nose is very nice; light and crisp. Overtones of wormwood and hyssop rounded out by anise. Just a hint of what I would call freshly cut celery. The taste is quite refreshing. Nice wormwood bitterness pairs well with the anise sweetness. No major flaws, but there is just a little bit of burn on the way down, and it's maybe just a tad too thin. Overall, quite a surprise, given its sponsor. However, its distiller has kept with his tradition of top notch distillation. An enjoyable drink. I may not appreciate MM very much, but I do appreciate his 'Mansinthe'. Appearance: IMO, one of the prettiest, short of Jade, that I've seen-- clear, bright, nicely green while still being all-natural... neither too pale, nor too dark. There are few out there that live up to this. Louche: Also among the best. Thick, pale green... beautifully translucent. Put a light behind it, you get nice shine-through like sun behind the clouds, while being thick enough to hide the light-source... In my experience, only Jade is better. Aroma: Good, solid, nice. Not something I'm strong on evaluating, but it seems correct, complex, and intriguing to me. Flavor/Mouthfeel: Also, really nicely done. As best as I can tell (being not the most experienced absintheur out there), it is entirely correct, well-balanced, and tasty. This one's done right for flavor. Finish: Really, the only flaw I find. It's still acceptable, but there is too much burn, I can taste the alcohol too much, in the finish. Doesn't ruin the drink, and it's not sub-standard-- other aspects of the finish are still really nice... but it does drop it (IMO) down to an "acceptable" "3" rather than deserving the more exceptional "4". Overall: it's good stuff. Well-made, solid-- worth respecting as a stand-out. Truthfully, because I drink absinthe more for taste than appearance, I may still prefer to reach for Lucid on ordinary days-- but I acknowledge that in the big scheme of things, this is a higher-quality distilling job. Again-- if you're not a fan of Marilyn Manson's music, don't let that push you away from this quality absinthe. If you are a fan-- worth appreciating that the man's got good taste in other areas too. From "The man that you fear". Appearance: A very light green, the lightest verte I've seen as of yet. Louche: Starts with swirling oil trails and forms beautifully, not too fast at first but then quickly developes. it seems as though it would lair well at first but then it takes over all at once. Flavor/mouthfeel: The mouthfeel is a tad thin. The trinity here is pretty straightforward anise and fennel play around, they are introduced to a light mintiness, then the crisp wormwood comes in. The flavor is creamy and satisfying but plays it safe. I will have to dock some points off for the thin mouthfeel. Finish: Goes from slightly creamy with anise and wormwood, to light peppery, and ends in slightly tingly. The longest profile of the finish being the slightly tingly. It still has room to entice and leaves me wanting more. Overall: A decent absinthe that is great to put things in perspective. 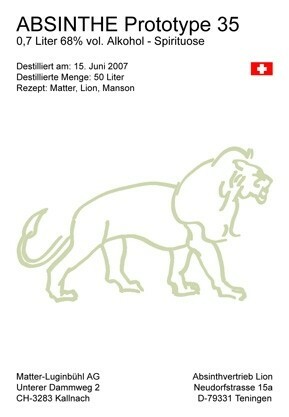 I would recommend it as a great absinthe to evaluate and identify the trinity (anise, fennel, and Grande Wormwood). It is great both for newcomers and serious Absintheurs. It is not one dimensional and not complex. This would be a good everyday absinthe. VERY pale green. Probably the palest absinthe I have tried. Pretty up to 2:1 then fully clouded. It starts out and looks like it is going to layer well. It has a nice thick oil layer. At 4:1 it is opaque white with a bit of blue on the edges. 4:1 is my preferred ratio for this particular absinthe. Very little sugar is necessary. Very anise forward pre louche. No alcohol burn. The previous reviews indicate a earthy/vegetal note. This bottle has a creamy sweet aroma. I like it. Anise and wormwood. It spreads across the palette well. Nice coolness on the finish. Slightly bitter mid palette. The numbness is nice. It does build with each sip which makes me want to drink it faster. The creaminess is still there on the finish. The numbness hits the tip of the tongue and lingers for quite some time. Its a nice offering! It is VERY easy to drink. I would use this one to introduce someone to absinthe. Appearance - Very correct and "pretty" in the glass. It isn't overly complex (not a "sit and stare" absinthe), but is it attractive. Louche - Beautiful. This was the best louche of our ten samples. Quite simply, it puts on the show we hoped for. The opalescent swirls continued well into the 4:1 point and were spectacular to watch. Aroma - Wow! That's a LOT of alcohol smell. It isn't even that it smells "stout" like Everclear, but rather something like rubbing alcohol with a strong hint of anise. Flavor - While very well-balanced between wormwood and anise, the alcohol heat and flavor is distracting. Being from Kentucky, I can draw a clear line between the sting of this absinthe and the lesser quality moonshine that makes the rounds at parties. Not the "good stuff" that has just enough burn to make you feel alive - the harsh stuff that feels curiously like sipping a glass of kerosene. Finish - Still a bit too much alcohol and goes away rather quickly. It feels more like I just drank a shot of herbal vodka than a really good absinthe. Overall - While Manson's presence made us both hesitant and curious to try the product, neither of us are huge fans of the band. On its own, Mansinthe is suprisingly enjoyable, although we wouldn't say it is everything we thought "traditional" absinthe would be. If the alcohol were tamed down just a bit, this would be a great offering. It's definitely nothing to sneeze at and we wouldn't dissuade anyone from trying it, but the alcohol is definitely a fault. Color: A nice, grassy green, but not too green. I think it might be a little light, but it's definitely natural. Louche: The louche is a little fast and thin (thinness definitely noticeable in the mouth,) but a pretty pearly greenish-blue. Aroma: Chocolatey sweet, with a very fresh anise scent, fennel, and a little bit of wormwood at the end. Flavor: I can't quite place the "green" flavor that it has, and there's a hint of soil and earthiness, with some wormwood near the end. Finish: Nice and fresh, lingering for a little while, with a pleasing flavor. Overall: This is something I'd rank into my "everyday" type of absinthes. It's not particularly complex or interesting, but it's not at all unpleasant or undrinkable. Definitely a good jumping off point for someone interested in trying absinthe or looking for an introduction to Matter-LuginbÃ¼hl products. It's not one that I'm hugely excited about, now that I've shifted to much more complex products, but definitely good to have around the house.